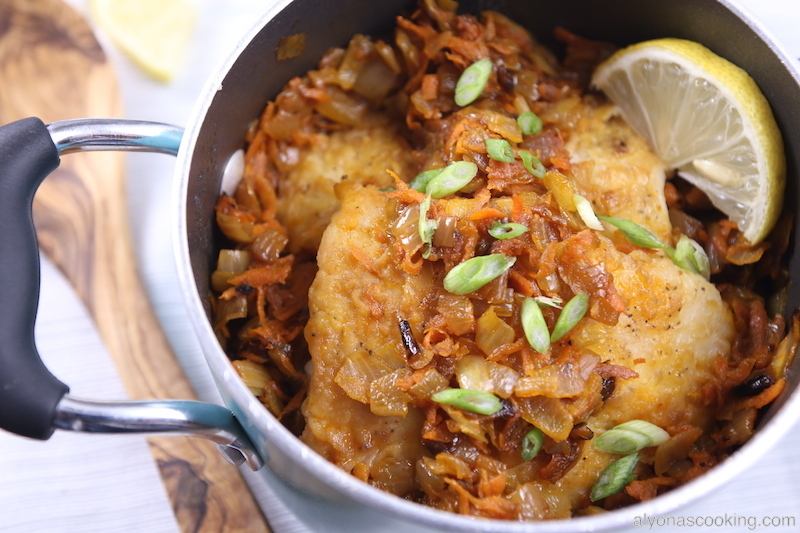 These seasoned and breaded swai fish fillets are seared on each side then covered with an amazingly delicious vegetable sauté and water. 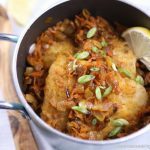 The fillets are then simmered on the stove top over low heat and the results turn out to be creamy, delicate and so full of flavor. I could eat these fillets, hot or cold there so good! Cut each fillet in half. 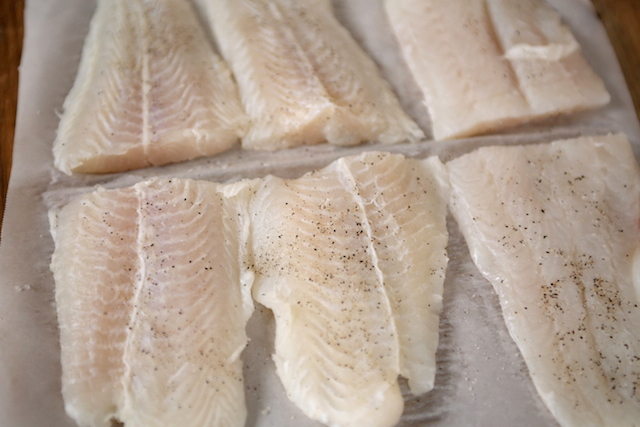 Combine the salt & pepper in a small bowl and sprinkle over each side of the fillets. 3. 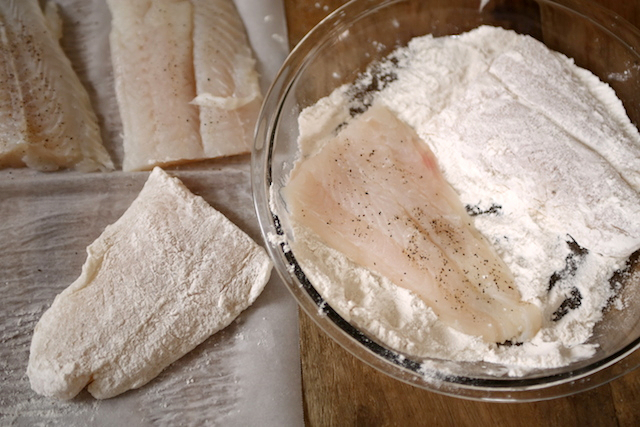 Place flour in a shallow bowl and drench fillet pieces in the flour to evenly coat each piece. Set aside. 4.) Dice peeled onion and grate 2 peeled and washed carrots. 6. 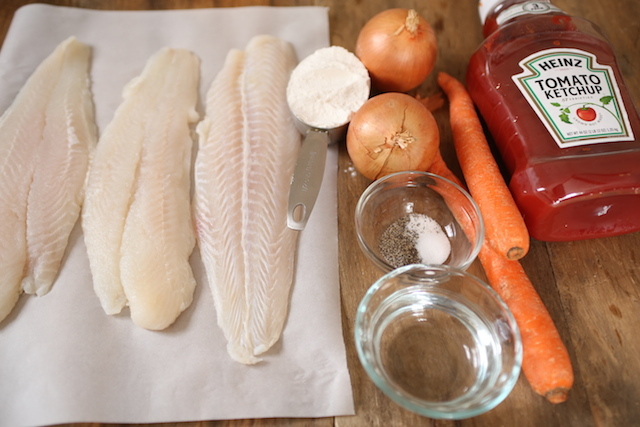 Remove fillets and wipe clean the pan with a paper towel. 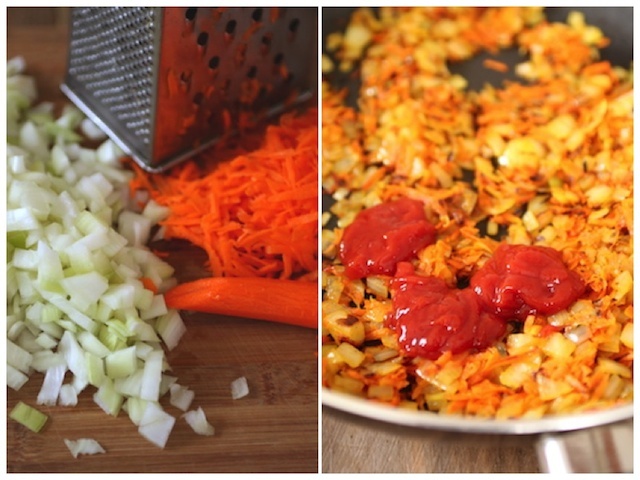 Add 5 tbsp of oil to the pan and fry the carrots and onion until soft and reduced much in size (10 min.) Add 3 tbsp of ketchup and sauté an additional 2 minutes. Set aside. 7. Place 2 tbsp of the sauté mixture onto the bottom of a small sauce pan. Then place 2 fillets over the sauté mixture and cover with 3 heaping tbsp of the sauté mixture. Repeat ending with the sauté mixture. Pour 1/2 of water over the top and bring to a boil over medium heat. 8.) 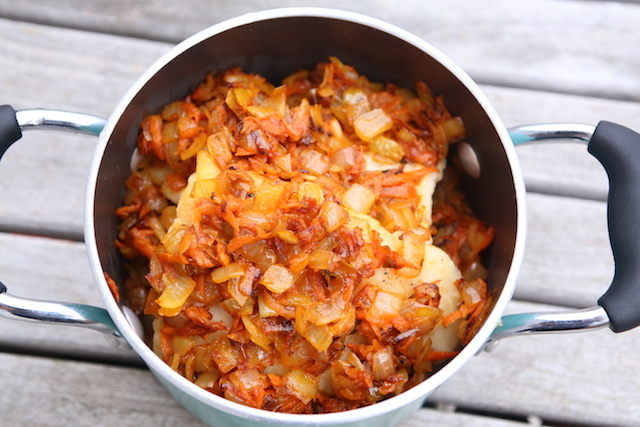 Once mixture comes to a light boil; reduce the heat to medium-low and simmer fillets for 15 minutes, covered. Place flour in a shallow bowl and drench fillet pieces in the flour to evenly coat each piece. Set aside. Dice peeled onion and grate 2 peeled and washed carrots. 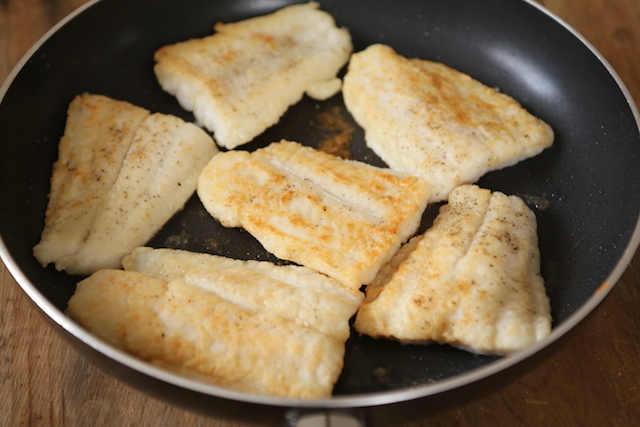 Remove fillets and wipe clean the pan with a paper towel. 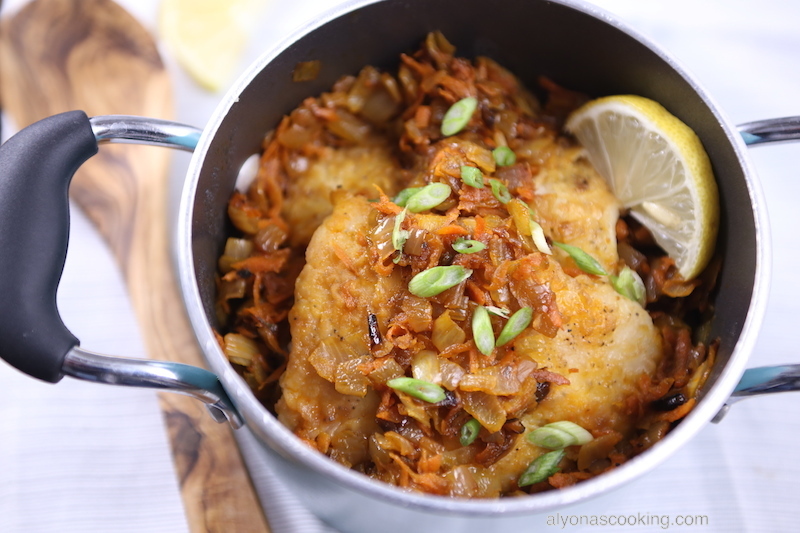 Add 5 tbsp of oil to the pan and fry the carrots and onion until soft and reduced much in size (10 min.) Add 3 tbsp of ketchup and sauté an additional 2 minutes. Set aside. Place 2 tbsp of the sauté mixture onto the bottom of a small sauce pan. Then place 2 fillets over the sauté mixture and cover with 3 heaping tbsp of the sauté mixture. Repeat ending with the sauté mixture. Pour 1/2 of water over the top and bring to a boil over medium heat. Once mixture comes to a light boil; reduce the heat to medium-low and simmer fillets for 15 minutes, covered. Looks really good!! Will have to try this out 🙂 thank you for sharing your recipes!